Is There a Market For Earthworms? Simply stated, YES! Earthworms are valuable. New markets open up regularly for worms because a worldwide shortage exists. Redworms are a very simple creature to raise and care for. Until recently, the earthworm market was mostly limited to the fishing industry, providing bait (literally billions of worms were dedicated to the job). Now, as ecological awareness grows, earthworms are also being used to compost organic waste. Our landfills worldwide are being helped by the worms' voracious appetite to compost. Universities and scientists alike are conducting studies to see just how helpful the effects of the worms can be. I would hazard to guess that the worm producing businesses that can support the quantity needed for these studies and larger composting markets will profit greatly from a monetary standpoint. The agriculture industry thrives on the use of worms as a way of rebuilding over-worked soil in fields as well as home gardens. These soils have been treated by commercial fertilizers and pesticides in the past. Those chemicals can improve plant growth, but do nothing to enrich the much needed soil nutrients, making the soil decline in quality and usability. Worms are little factories that produce high quality fertilizers from an organic waste load. You may want to raise earthworms for household or garden waste, producing organic fertilizer for your own use. You may be an avid fisher person who wants to use them as bait while selling them on a small or even large scale. Redworms can grow and reproduce under a wide array of conditions. You will have to find the method for you to use and then adapt it to what is practical for your situation. 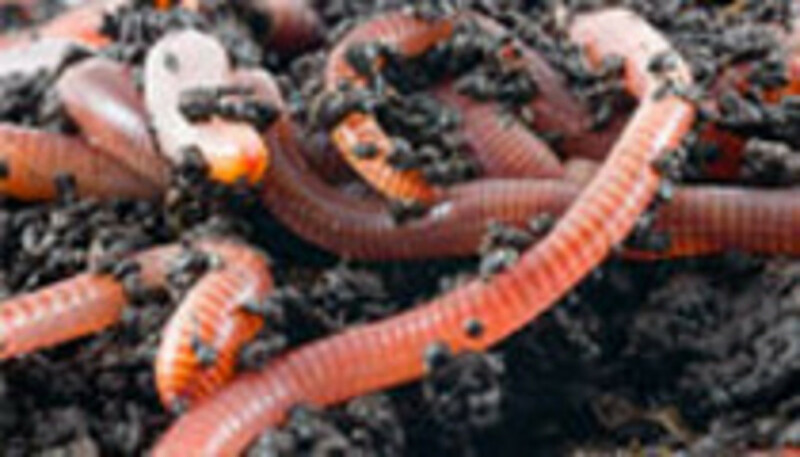 Know this: if you enjoy working with the natural things in life—if you have an interest in watching creatures grow and wouldn't mind putting a few bucks in your pocket while doing it—growing redworms is absolutely for you, Most worm farmers find it quite easy, even if you have to get your hands dirty once in a while. Be assured, if done correctly, raising worms is an undeniably easy and enormously rewarding business from a personal standpoint as well as a monetary one! Where is the Money in Raising Earthworms? Worms are prolific; they reproduce in rapid form when provided with a healthy environment. Literally millions and millions of dollars worth of earthworms are quietly sold every year by everyday people just like you. 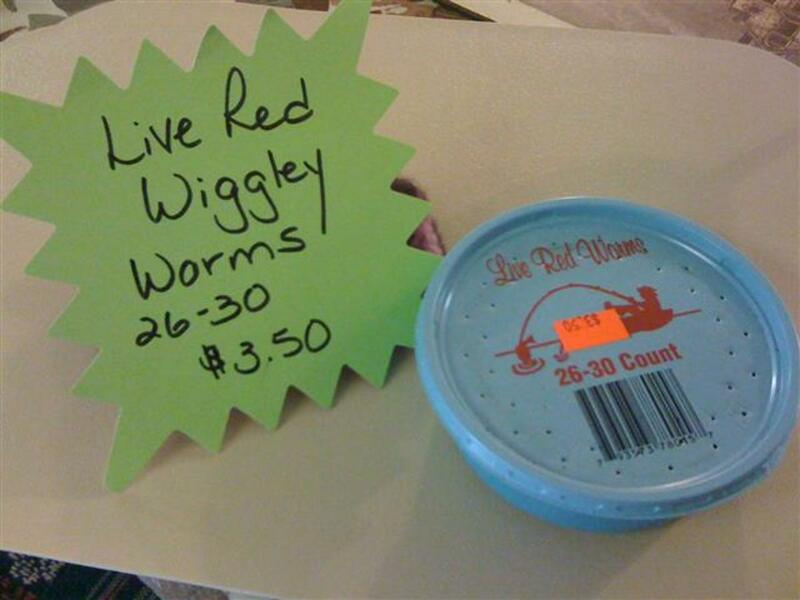 Growing redworms is a full time, profitable business for many folks. For others it is a nice supplemental income. Many situations begin as a redworm hobby for personal use; for fish bait, and for the sake of ecology and recycling food waste. Over time, these hobbyists realize the potential for a monetary venture and decide to grow the venture into a business with little to no trouble. Most commercial growers operate as independent business owners and work at a pace which makes them comfortable and happy. A grower who learns how to grow good quality earthworms and deliver them reliably to customers in good condition, rarely has very far to look for new clients. More likely, he or she will have to determine how quickly they want to expand their business, and manage that expansion so they can continue to provide the same level of customer service. Customers will spread the word quickly when it comes to good service and quality earthworms, as worms are always in demand. Earthworms are sold in a variety of markets and used for a variety of purposes: fishing, soil improvement, and fertilizer production. Any good business person will tell you that a consumable product is a profitable product. And earthworms are very consumable! As the world population grows, so does the need by anglers and gardeners to buy more worms. Even as new worm growers start growing each year, the supply is never enough to meet the demand (especially during the peak spring season). Bait and tackle stores that are far from worm farms will frequently buy the product via mail order. It is not unusual for a worm grower to have never met the customer he has been servicing for several years. The sport-fishing industry is a huge buyer of redworms world wide. Fishing with live bait is always a dependable and traditional way to catch a wide variety of fish. When an angler serves-up a juicy wiggly worm, it's impossible for a fish to resist (worms are a natural food choice for fish). If you look closely, even fisher people using artificial lures will have a cup of worms as a back-up plan, guaranteeing their 'catch of the day' fishing reputation. A large market for redworms is found among those who are looking for "breeding stock." The end customer may be a new grower stocking new beds or an established grower restocking old beds. Many times a wholesaler will buy the worms (never to grow a single worm of their own) and put them in cups so he can sell to his local market. Gardening and seed and flower magazines often run articles raving about the attributes of worms in the garden and using them as compost machines. Earthworm growers often find a grand bit of business by running ads within these plant, garden and composting style publications. More frequently then not, after advertising a few times, their customer base is established and the worm growers never have to advertise again. They end up with ALL of the customers they can supply. Earthworms are the farmers best friend, so a market to sell to these agricultural endeavors is very big, because the worms rebuild soil quality. Worm castings (that is, worm poo) enhance the soil quality with an enormous amount of nutrients. Unlike regular fertilizers, worm castings won't burn your plants, yet they contain five to ten times the amount of nitrogen, phosphorus and potassium and other nutrients of regular gardening soil. The majority of elements in the worm castings are water soluble and are introduced easily to your plants, for example in the form of worm tea. 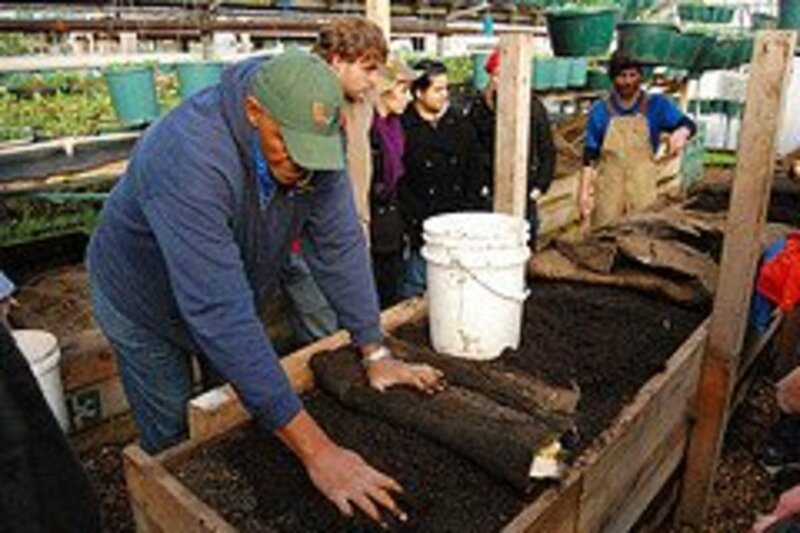 Worm tea is a by-product of the organic worm composting process. Worms break down organic matter into castings that enrich soil, reduce waste build-up, and enhance plant growth, while helping to control diseases that attack those plants, and much more. 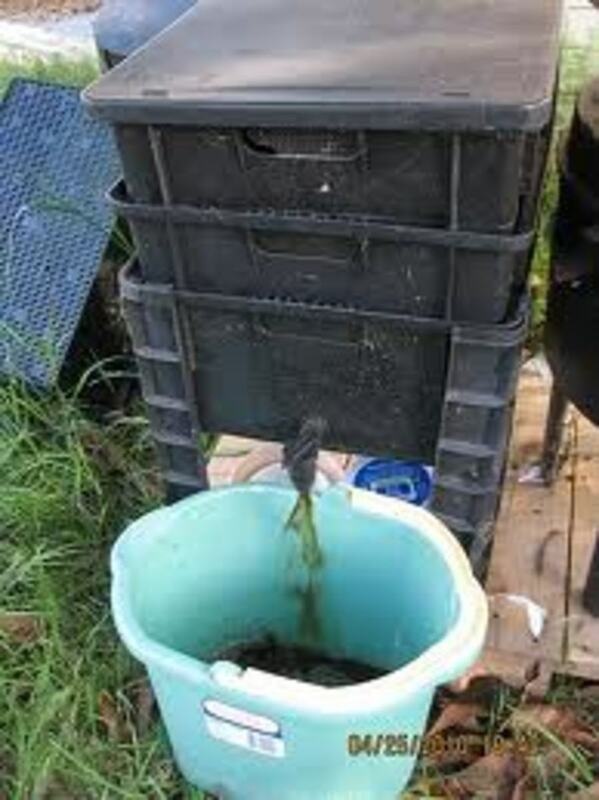 The water that has been used to keep the worm bins moist or to harvest castings gets collected by the worm grower's strategically placed containers. This water has diluted castings in it, making it a rich source of plant and garden nutrients. Using worm tea on potted plants requires adding an equal part of fresh water to dilute the solution (it is VERY concentrated nutrition). 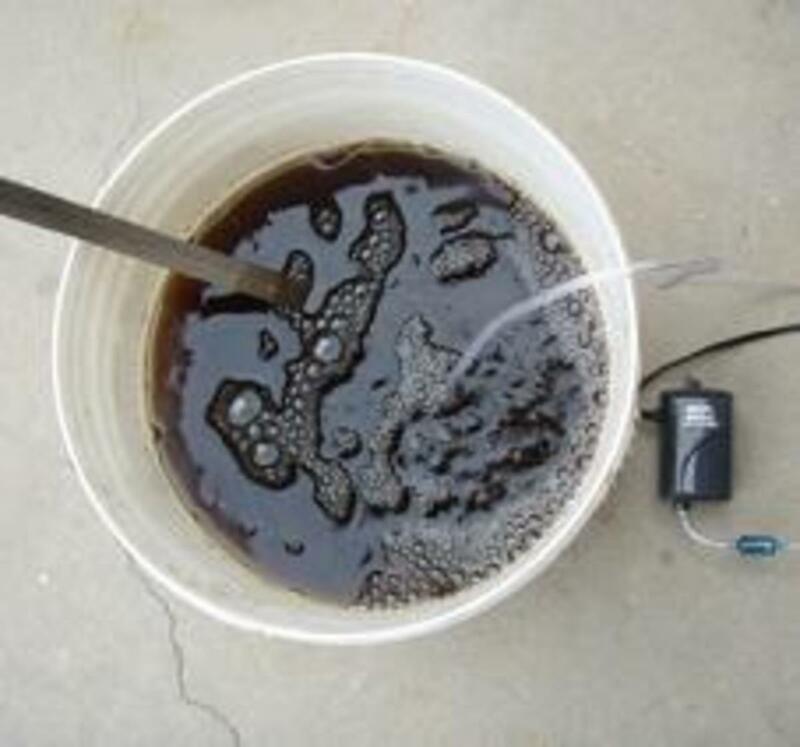 The liquid has a revitalizing effect on old potting soils. If you choose to use the worm tea on plants in the ground, using it full strength is fine. You will find that your sick or weak plants will benefit significantly from a drink or two of worm tea. Roots of stressed plants have shown a real increase in vigor when treated with worm tea. Drench plants with worm tea or use during your standard feeding agenda. Spouts on worm bins make collecting worm tea an easy chore. Are You Going to Make Your Worm Business Big or Small? 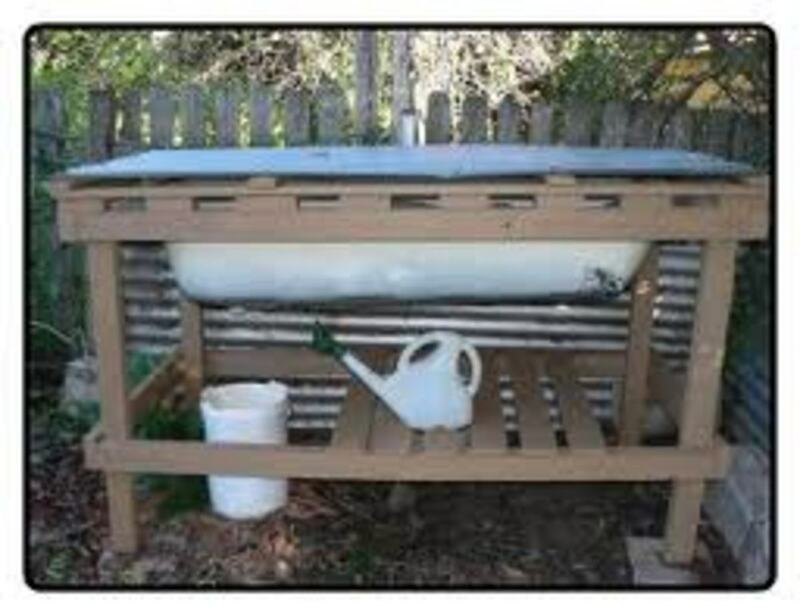 Cheap, easy, small business worm farming can be as easy as putting an old basin to another use! Larger worm farms take more attention. You can grow worms just about anywhere, from Styrofoam ice chests to old refrigerators to large bins in outdoor buildings. Worm farming is said to be the fastest-growing agricultural industry in the country, making millionaires overnight; that may be an exaggeration, but there are a lot of true stories being told about easy money being made from the worm farming business. Once you decide to start a worm farm business, you will need to get the things required to get things rolling right off-of-the-bat. The following is a general list that will work for most worm growers (vermiculturists). Your worm business may or may not need everything listed, or in some cases may need more. A commercial worm farming can be beautiful and span hundreds of yards. It's up to you how much space you have and how much effort you want to place in your worm business. Read, read, read—Consume every bit of data you can find on the subject. Bookmark this article! Get a really good idea of what you are getting ready to undertake. 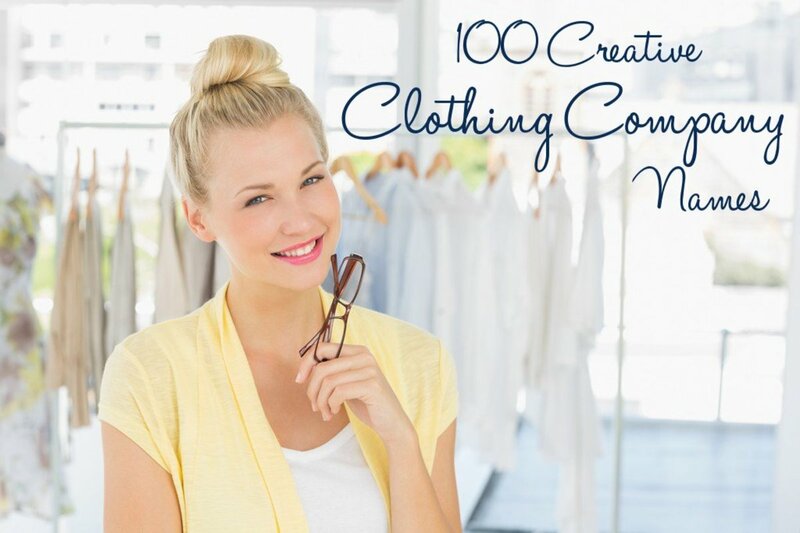 Decide how big you want your business to be. Are you more comfortable starting small and then growing up your worm farm? Is there room in your backyard for a large operation? If your business blooms, is your property zoned to accommodate the growth? 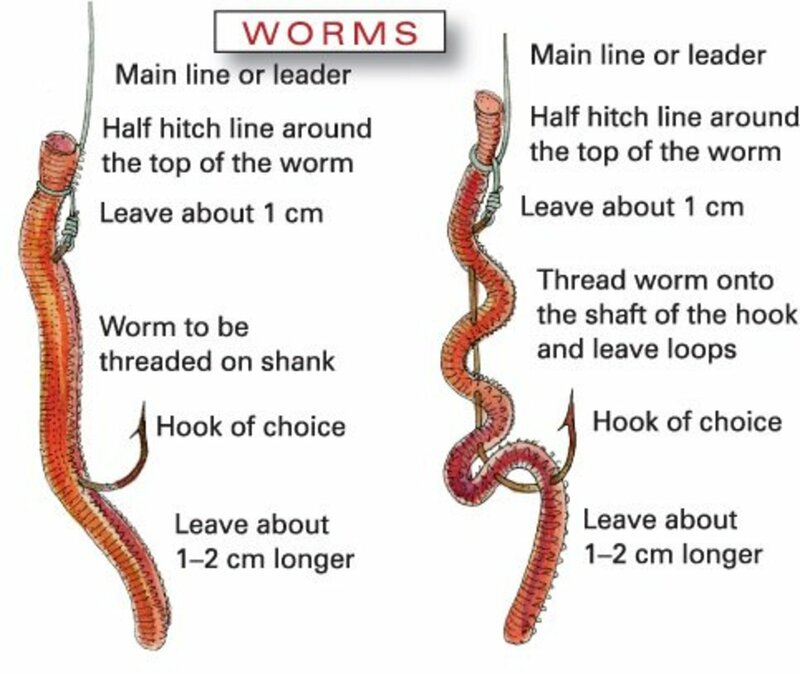 Decide where to place your worms on your property; near a water source, near electricity, or maybe in a shed. What is the best place considering the climate fluctuation in your area? Where will the beds be easy for you to tend, considering your back health and height)? 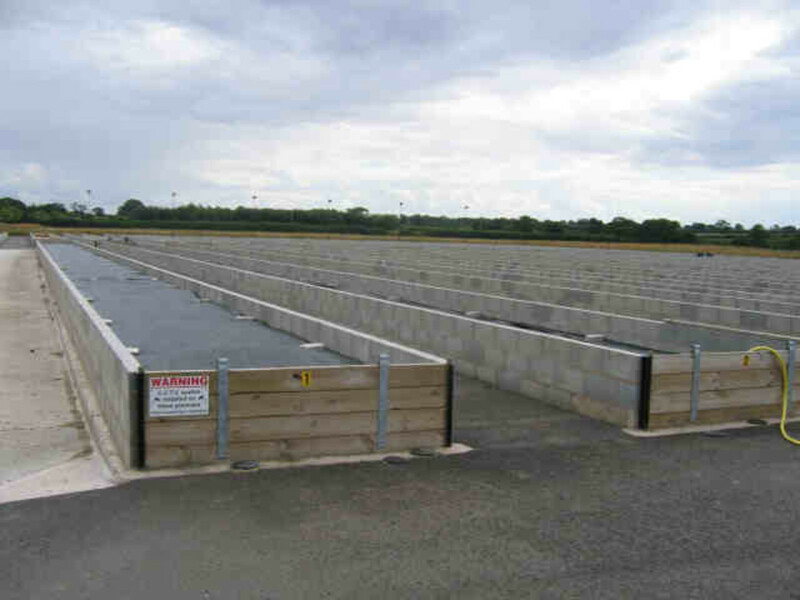 Find a supplier that can provide enough bedding and stock for an operation of your size. Do you have a horse ranch or paper Mill close to you? Be aware that when acquiring manure you must ask what if any de-worming medications are given to the providing animals. These medications can and will also kill your worms. Get the proper tools; a pitchfork, pH meter, compost thermometer, hand claw garden tool, and a shovel. A paper shredder will prove convenient if you decide to use paper as your bedding source. Redworms require one square foot of surface area for every pound of worms. Most worm growers estimate there are approximately 1,000 adult redworms in a pound. But, this isn't a figure you need to know, because commercial worm growers only sell their worms by the pound. You will need to build or buy commercial bins, or build windrows, to accommodate the quantity of worms you decide to grow. Windrows are worm beds that are in the ground. Many worm growers prefer this type of bed because they feel it produces a better, bigger and healthier worm. These beds generally have very good drainage and aeration, and the food is in good supply. And if the conditions get out of control, the worms can migrate to another location within the bed until the proper conditions are available again. Get ahold of the bedding and feedstock: the organic material that is fed to worms. Take care of any preparation of that material that is necessary. Are you shredding newspaper or leaching manure? 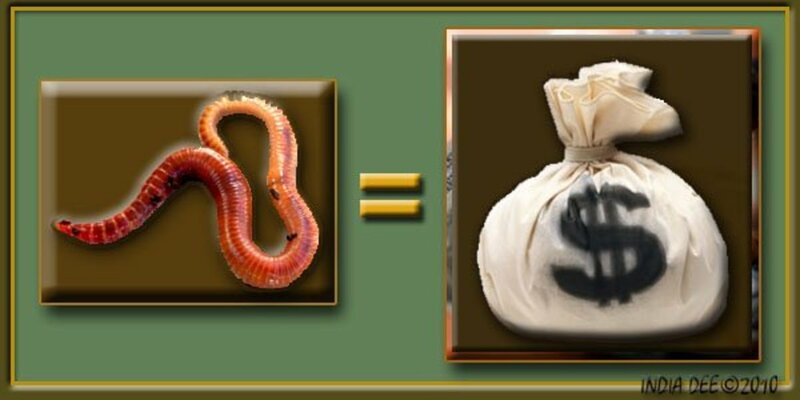 Buy your worms. Make certain that everything is prepared for the worms before they arrive! Know the scientific name of the worms you have decided to grow. This article is mostly about redworms, Lumbricus rubellus. Redworms grow best in moderate temperatures (from 59ºF to 77ºF). So spring generally seems to be the best season to get things started. Redworms will mate throughout spring and again in the fall, depending on outside conditions. But, if you can control the environmental temperature, using shade, cool cellar space, fans, sheds, and so on), any time of year is the perfect time of year to begin your worm-growing business. Worms who are kept where it is constantly warm can continue to reproduce year round. Keep in mind, when you put together your worm bins and growing system, that most worm growers will agree on one important thing: temperatures under 50ºF or above 86ºF can be quite harmful to your worms. 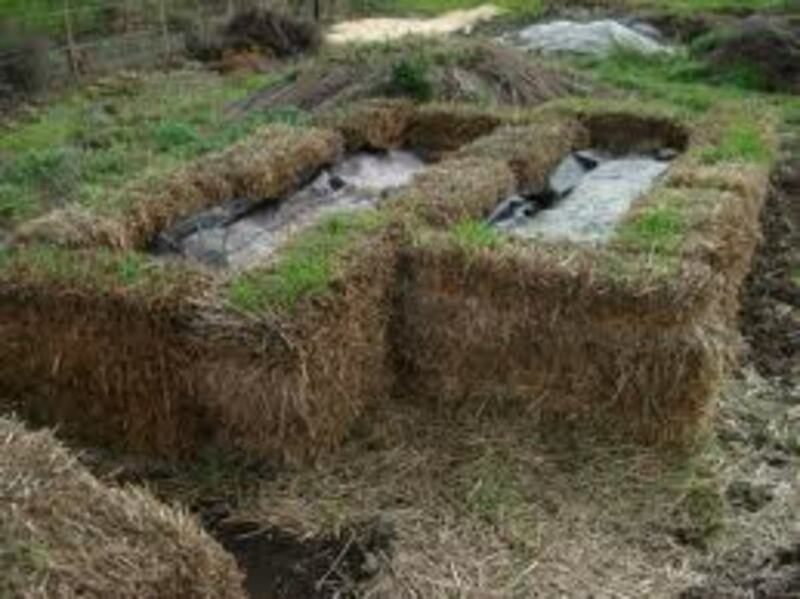 Above-ground worm beds insulated with hay bales to protect worms from extreme weather. As well as finding the right temperature for your worms, keep in mind where you place your beds, after all, you want the beds to be convenient for you to work around and to tend. Large worm bins require water frequently, so place them where you can easily access a water source. Small bins can be sprinkled with a watering can. Keeping a light on outdoor worm beds at night is helpful to discourage the worms from migrating out and away from your housing bins. So, it may be a good idea to place them near an electrical outlet, just in case. Worms tend to move away from light. To them it represents the sun, a worm's worst nightmare. NOTE: Never place a worm bin next to a refrigerator or anything that vibrates. Earthworms don't like a lot of movement around them so they will not do very well under these circumstances. Cover the worm bin with Styrofoam or thermal insulation. However, be aware that these products do not breathe, so be sure to leave ventilation spaces so your worms get enough air. Stack hay bales on and around the bins or beds. You will have to move the bales when you go to tend to the worm beds. Locate the bin in a shady tree-laden area. Often this idea gets forgotten but it can help keep your earthworms cooler when the weather gets too hot. Place wet towels over the bins on very hot days. The evaporation will help to cool the bed. Add a fan if you need more air flow. To raise the temperature, place a low-wattage night-light inside the box. Be sure it is grounded so you don't give your worms an uncomfortable zap. Add a bit of fresh green waste to the bin to warm it. Don't use too much: the thermogenic bacteria in the early (fresh) composting process can really heat things up. Place the green waste on one side of the bin, so if it gets too hot, the worms have room to move to the opposing side to chill out. Heaters made for reptiles and bird baths can also be used. Check your pet store for one that can be kept safely in a moist place. Some offer adjustable thermostats that are very helpful. Lumbricus rubellus is a very active wiggler when it is in the light. Sport fishing experts say this worm is irresistible to fish and is in fact, the perfect bait. The worms expel an amino acid that the fish lack, causing the fish to impetuously race to the dangling wiggly redworm. It makes a good compost worm. Like nightcrawlers, they aerate and mix up the soil. They can be found in soils that have a rich organic make-up, doing best in ranch pastures and compost bins or piles. Color: Slightly iridescent on top, dark red to maroon. Lacks stripes between segments and is light yellow on its underside. Most scientists agree that earthworms have been on earth for at least 120 million years. Earthworms have developed into a very specialized critter that has perfected the management and transformation of those things we consider waste, into some of the most useful stuff. They have no eyes, ears or nose, yet they do have senses. No jaws or teeth can be found within their tiny mouths, yet they munch their food at a significant rate. Every worm is both boy and girl—yet it still takes two earthworms to create baby earthworms. Describing an earthworm to someone who has never looked upon the squirmy creature, is like speaking of an imagined being that is far too good to be true. But, fortunately for us, earthworms most certainly do exist! Can Earthworms "Hear," "Smell," and "See"? The answer is both yes and no. As do snakes, earthworms sense vibrations, thus "hearing" their surrounding; they use their setae, slender, bristly and springy hairlike organ. The surface wall of the worm's body has several nerve receptors that taste chemical changes, thus "smelling" the surroundings. Other nerve receptors can determine the light concentration, thus "seeing" their environment. A bit of worm trivia is that earthworms can't detect (or "see") the color red. The most fascinating fact regarding redworms has to do with the concept of boys and girls. 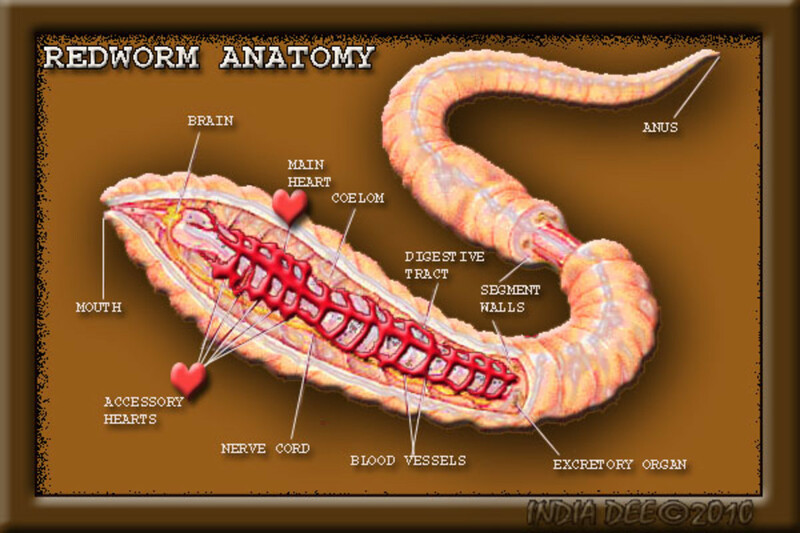 Our friend the earthworm has been created with both male and female reproductive organs, making them hermaphroditic. In Lumbricus, we find two male segments and one female segment. Three to six weeks after hatching your earthworms will mature enough to complete three mature worm tasks; forming the clitellum to produce mucus for copulation, to discharge the wall of the cocoon, and to secrete albumin, in which the eggs are deposited inside the cocoon. In the clitellum there are three layers of glands that do these three separate functions. When this state of maturation is completed, pairs of worms will line up head to toe to begin the breeding cycle. A few days following mating, the worm secretes a cocoon where the eggs will be deposited. A cocoon can contain any number of eggs, ranging from one to twenty, depending on the species of worm. Lumbricus will usually have only one or two eggs that will actually hatch from the cocoon. However, adult worms may mate and produce cocoons continually every three or four days all through the spring and again when fall comes around. And as noted above, if you can provide constant warm temperatures for your worms, they can reproduce year round. They are very prolific critters who never sleep, don't watch T.V., and have no hobbies, leaving breeding the main thing to do, and very frequently. You will start to see tiny yellow debris among your worm beds once your earthworms begin to mate. These are actually the new yellowish lemon-looking tiny cocoons, with your next generation of worms growing within. They darken as the embryo grows, feeding on the albumin that was deposited inside each cocoon. In time, the young worms hatch from the ends of the cocoon. This time span varies widely from species to species and also depends on the climatic conditions. Our friend the Lumbricus' cocoons will hatch from 12 to 16 weeks after conception. 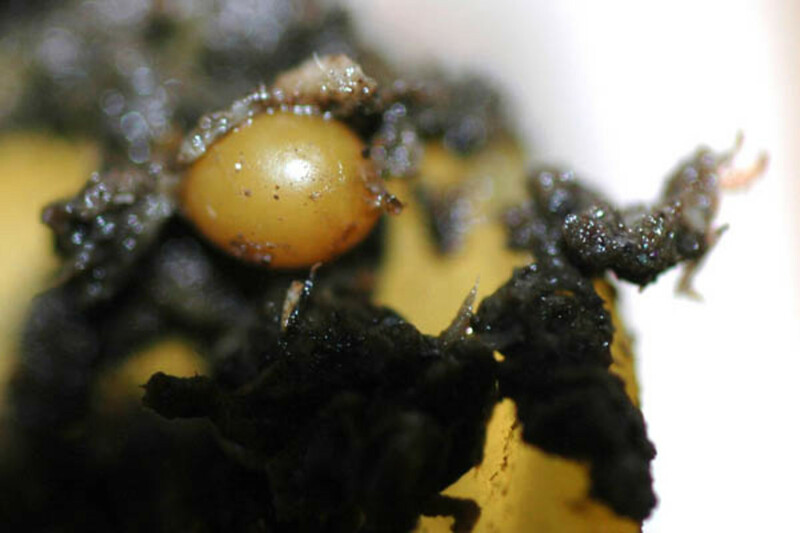 Tiny yellowish lemon-shaped earthworm cocoon. I live in Northern, lower Michigan. How do I keep my earthworms from freezing? Provide an indoor place (garage or barn) keeping them in a raised bed. A heat lamp on low should keep them safe. Comments for "How to raise worms for easy money"
I never knew earthworms could be so useful and lucrative! Good info! Very interesting hub. May have to look into this subject further! Cheers, voted up! I started a worm farm and have it in a plastic container. I didn't know you have to test the Ph in the container what is the best thing to use to test the ph in the container. why do you need to test the ph. This was so thoroughly covered. I learned so much that I did not know. Of course I knew about earthworms...I have even handled my share of them, albeit, reluctantly. When I was a young girl my Daddy taught me to find them and to cut them to use for bait. Yech...did I really do that? I had a friend whose parents raised them in their cellar. The whole cellar was devoted to raising them and the money they made from it was quite lucrative. An excellent article about worms and worm farming. I have been busy with earthworms and really think that your article stands out. Below find my building instructions for a home made 3 tier worm farm. To help all those that want to save some money. Building a homemade worm compost bin is not a difficult task. 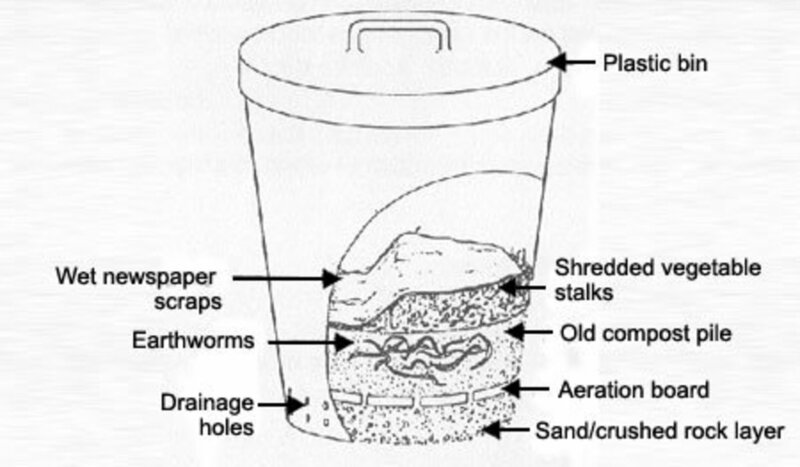 Follow the guide below and build your homemade worm compost bin today! •Start with the 2 bins that will house the worms. The holes should be about 5 cm / 1.96 inches apart from each other. These holes are important to prevent the worm bin from becoming flooded. The worms need oxygen to survive and could drown! bin. If you can’t get hold of a tap use a cork of a wine bottle instead. Make sure the hole saw bit or drill bit you use will be just a tiny bit bigger than the diameter of your tap that you want to attach to the bin. Drill the hole for the tap as low on the wall of the worm bin as you can, but leave enough space so you can fasten the nut of the tap inside the bin to ensure a tight fit. •Next attach the tap to the bottom bin. Now you will need a lid for your worm farm. If your bins came with a fitting lid that’s great. If not you’ll have to make one yourself. Get a plastic sheet that is the same size as the surface of your bins or slightly bigger. The sheet should be 3 to 5mm / 0.11 to 0.19 inches thick. Place one of the bins upside down on top of the plastic sheet (see photo above). Mark the lid with a pen or pencil to show the edges of the bin. Saw the marked edges of with a jigsaw or cut them off with a strong pair of scissors. •Assemble the bin and you are ready to start your worm composting project! your worm bin outdoors place a small flower pot on top of the lid to keep it in place in case of wind! Your worm farm should not stand in full sun as this might cause a serious problem for your worms on a very hot day. Good places to place your worm bin are in shaded areas for example under a tree, in the garage or in a shed in the backyard. Great article! Extremely extensive. I actually think I would've separated it into two separate articles. However, I have no complaints. So do you sell worms yourself? I have a small worm composter that I keep in the corner of my kitchen. I've only had it for two weeks but I noticed that there are baby worms hatching, which means I must be doing something right. Whee! I was wondering if there was a market for selling a few extra worms and worm castings locally on Craigslist? What do you think? P.S. I got the composter to help reduce waste but I found a side benefit: My pet goldfish love their worm snacks! kentuckyslone~ Thrilled you find the worm farming guide worth bookmarking! I supplement my income with the earthworms I raise and it helps out quite a bit. I also use them in my own gardening endeavors as they really increase my vegetable output. I also give a few worms daily to my chickens during moulting, as the birds require extra protein while creating new plumage. It takes a lot of protein to make an egg! Best of luck to you in your worm farming pursuits! frugalfamily~ So glad you found everything you need to know to start your own worm farming adventure! Making a few extra bucks, or possibly those big bucks, is pretty easy when the worms do all of the hard work for you! I wish you the best of luck. Everything I was looking for. Thanks a trillion! Okay....I've bookmarked this page, and voted it up. 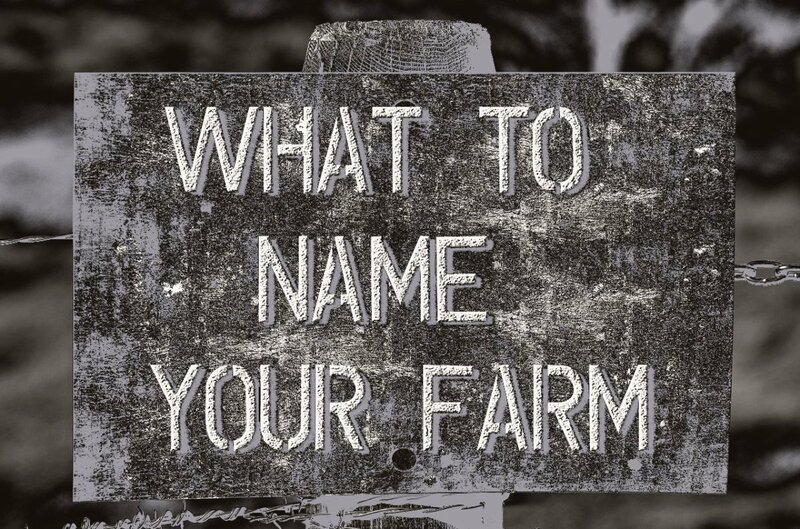 I have a lot of land, so this idea will be thoroughly researched and considered. Nice job! WOW! This page is amazingly extensive. I have to admit that I didn't read every bit of it yet but it just so happens that I have been thinking about raising worms and just chanced upon your hub while browsing. kiwiGal~ I hope you enjoy reading the series and that maybe try doing a little worm farm. Its fun, generates some money and it is the environments best friend! Thanks for the read! Izzy~So flattered you stopped by, and thanks for the super nice comment. I love those darn earthworms for sure, mother natures sweetest gift to gardeners! Excellent hub choc full of information! Rated up! Great information, will be reading the series over the next couple days. Practical advice written in a very informative way. Tara~Thanks for the comment. Raising worms for money is a really good family project to consider without a doubt. You make a little scratch on the side and help the environment at the same time! Thanks for stopping by. Super detailed hub! Had never considered this. 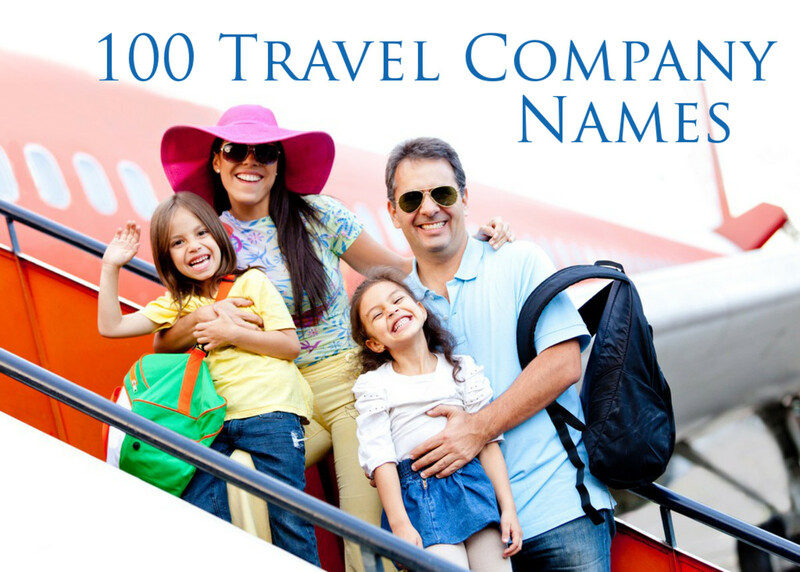 Might be a fun project for the family! Thanks! SG~ You're right, kids love this kind of project. They get to play in the dirt and touch worms! It's a great project for the envirornment also. Thanks for stopping by, always glad to see you here on hubpages. Supercool article, explains everything, is very interesting! Worm tea! And how useful and recyclable! Now if I could just get up the desire to breed and sell worms! I think it would be a fun project to do with kids! Gus, Aiden and Lady_E~ Thank you for coming by to read about the worm business! I really appreciate the comments and I do hope someone finds this hub useful in helping to start a worm business or home composting. Wow. This is new to me and I enjoyed reading it. Thanks for all the illustrations. This is a brilliant hub with lot's of great information. I started a wormery about 2 years ago with tigers and dendrobeanas, went really well for about 18 months then was invaded by a whole host of creepy crawlies. The wife made me get rid of it but I did salvage a mini wormery in the shed; "hope she doesn't find it". K9K - Now THAT was a very complete and detailed article with fine illustrations. I would make the guess that there will be some folks who decide to give worm-raising a shot after they read it. Nice work.